This first or 'simple' design is so easy that even a beginner can do it! All you need is a dotting tool or bobby pin to do the dots and a bow which i secured with nail glue (this bow is from Born Pretty Store). I used OPI 'Alpine Snow' & 'Christmas Gone Plaid'. I love this green. Seriously, could the Gwen Stefani holiday collection be any better?? 'Christmas Gone Plaid' is so much more 'green' than it comes out in photos. Inside it can look quite dark but in direct sunlight or under good lighting the green is really prominent. The second wreath I did is a little more elaborate but still very easy to do! 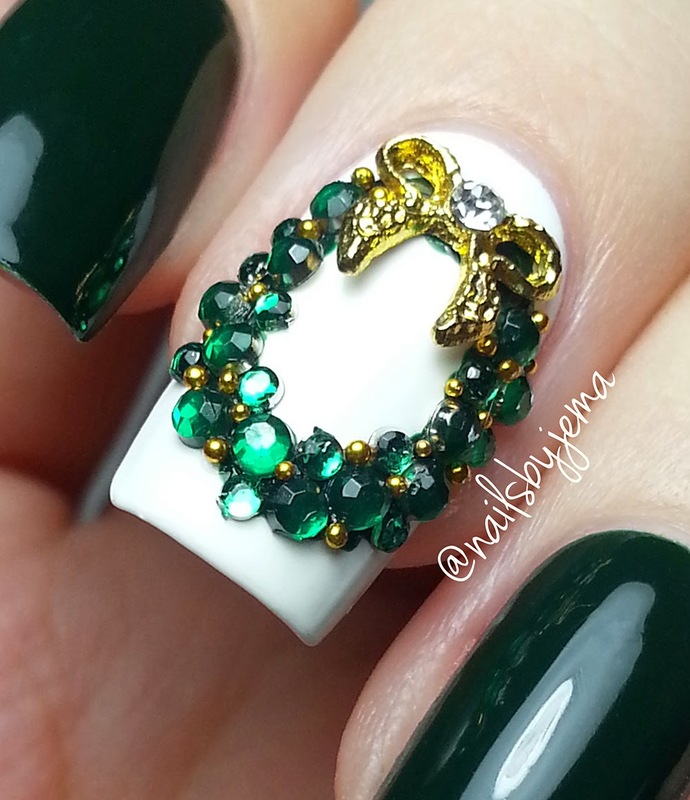 I used two different sizes of green rhinestones and gold caviar beads and placed them on a circle of OPI 'Christmas Gone Plaid' over OPI 'Alpine Snow' with a wax pencil. Top coating everything will keep the rhinestones in place. This one is one of my favorite manicures for Christmas. 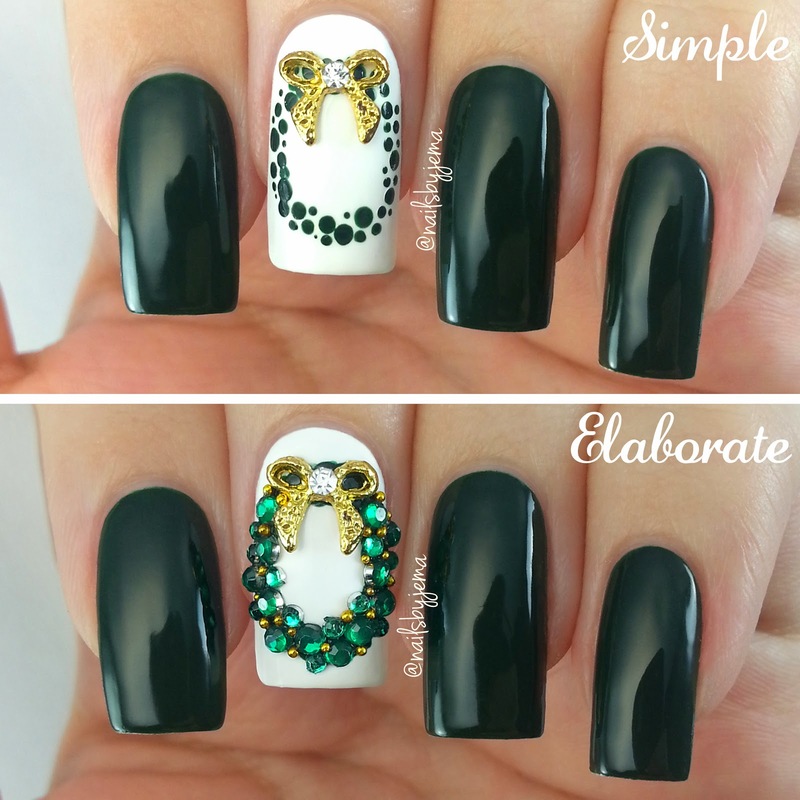 It's simple to do on both hands and really has the WOW factor. And now for the tutorials. Song is Britney Spears - My Only Wish (This Year). 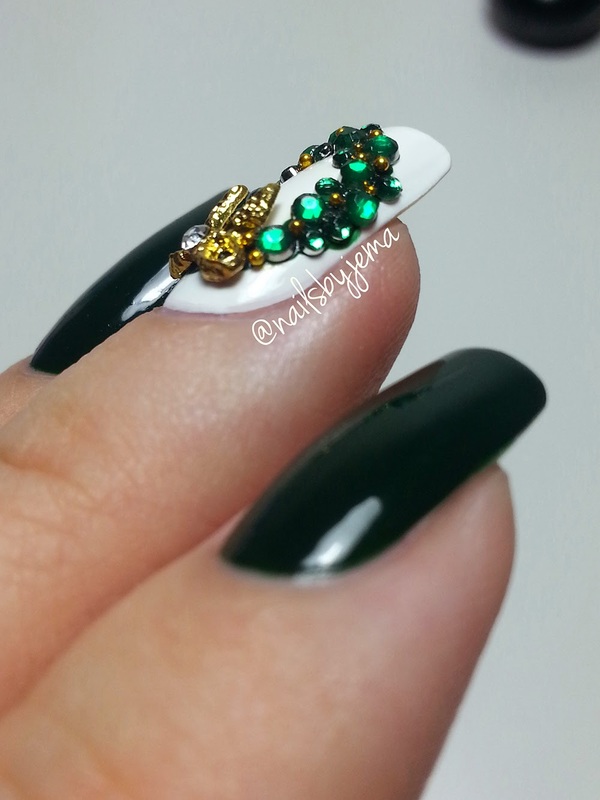 The 'Simple' wreath nail art was so quick to do, especially since it's just one feature nail on each hand. OPI 'Christmas Gone Plaid' looks black in the light created by my nail lamp! I used my white Uniball Signo gel pen to mark out the circle for the wreath so I didn't have to keep checking the shape as I dotted, and then wiped it off when my polish was dry and before adding top coat. That's the point of the random white line haha. My dotting tool is from eBay and a set of 5 will only cost $1, but if you don't have any, then the end of a bobby pin or toothpick works perfectly. Rascal Flatts - Jingle Bell Rock. For the 'Elaborate' wreath I just painted over my last wreath to save polish and time, but you can follow the steps of the other video to get a circle and then messily draw in a circle of polish for the wreath. I'm using a cheap nail art brush from eBay since I'm using polish for this, and nail polish remover will eventually destroy your brushes, so get some cheap ones. While the polish is still wet, use a wax pencil or some tweezers to place the bow first (so it has enough space), then the large rhinestones. Fill in the larger gaps with the small rhinestones & finish with filling the smaller gaps with caviar beads. Top coating it with a good top coat will stop the rhinestones and beads from falling off. I removed the bow after all the rhinestones were placed and then glued it down with nail so it wouldn't come off easily. 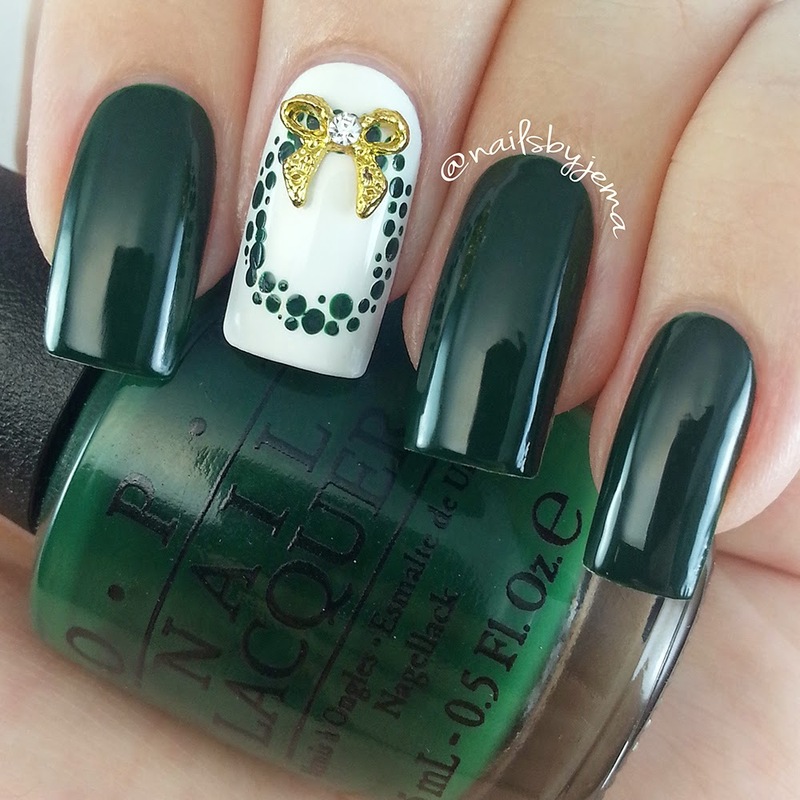 This is a little more time consuming and fiddly than the dotted wreath but it makes a gorgeous statement nail. I hope you like these and the videos help recreate these for Christmas.